Kombucha is a naturally carbonated beverage made by fermenting yeast and bacteria with sugar. Kombucha is not a mushroom, nor is it a tea, although it's commonly called both. Kombucha is a mild drink that is often consumed for its purported health benefits. Proponents of kombucha claim that it has immune system stimulating and antimicrobial properties, which may be of benefit if you experience chronic sinus infections. However, one should drink kombucha, not inhale it into the sinus cavities. Consult with your doctor if you have sinus pain or other symptoms. 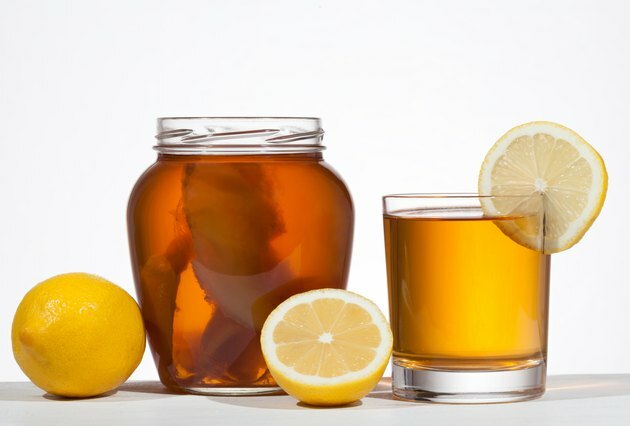 Kombucha looks and tastes somewhat similar to sweetened tea, although it’s the byproduct of adding water and sugar to a solid mass of yeast and bacteria, which forms a fermenting kombucha culture. The solid mass looks like a mushroom, but it’s not. The name is derived from a Japanese term meaning “yeast mother,” according to the book Chinese Herbal Medicine: Materia Medica. Black or green tea can be added to the fermented product to make kombucha tea, and this variety is more commonly sold in health food stores. Some people prefer to make it at home, although you should guard against contamination. Kombucha beverage contains numerous species of non-pathogenic yeast and bacteria along with the organic acids, enzymes, amino acids, B-vitamins and polyphenols produced by these microbes, according to the PDR for Nutritional Supplements. Acetic acid is the most prevalent acid produced by the fermentation process, which explains why kombucha tastes mildly like vinegar. Fermentation also produces alcohol, although commercially produced kombucha contains less than 0.5 percent ethanol, which classifies it as a non-alcoholic beverage. If kombucha ferments for long enough, it will become quite sour or acidic and contain upwards of 1.5 percent ethanol. Sinus infections are caused by pathogenic varieties of bacteria or certain types of viruses. Sinus infections lead to facial pain, headaches, mild fever and nasal discharge. Allergies create nasal congestion primarily. Kombucha is not a well-recognized natural remedy for sinus conditions. It may help to stimulate your immune system and it may act like a weak antibiotic, but no studies have been conducted to offer evidence. In rare instances, drinking kombucha might actually aggravate your allergies or contribute to infection if the beverage is contaminated. Consult with a naturopath or practitioner of traditional Chinese medicine to better understand the benefits and potential side effects of drinking kombucha. Health benefits attributed to kombucha include stimulating the immune system, combating infections, preventing cancer, and improving digestion, according to the book Principles and Practice of Phytotherapy: Modern Herbal Medicine. However, there's no scientific evidence to support these health claims. Many of the acids in kombucha, especially acetic acid, display antimicrobial properties and the polyphenols are potent antioxidants. Furthermore, organic acids and enzymes contribute to the digestive process. On the other hand, making kombucha at home carries a small risk of contamination, which could lead to stomach upset, allergic reactions and possibly infections.